The photo above, another from the collection of an unknown photographer, was taken some time in 1936. It shows a typical Sunday afternoon scene in Sydney’s beautiful Domain. The Domain has always been a centre of social activity, and during its history has attracted not only picnickers, but public speakers who took position on their soapboxes and spoke to the assembled masses. In fact, the Domain has even been described as a social safety valve, with many social causes and conflicts being aired and debated in the beautiful grounds. Freedom of speech was celebrated at the Domain, but it was not always peaceful, or indeed appreciated by the authorities. At the time when this photo was taken, during The Great Depression, speakers in The Domain often spoke on political subjects, and violence was not unheard of. Both speakers and crowd members were sometimes even arrested. The photo shows an altogether more relaxed scene, with two speakers shown, but who knows what happened before, or indeed after the snap was taken! 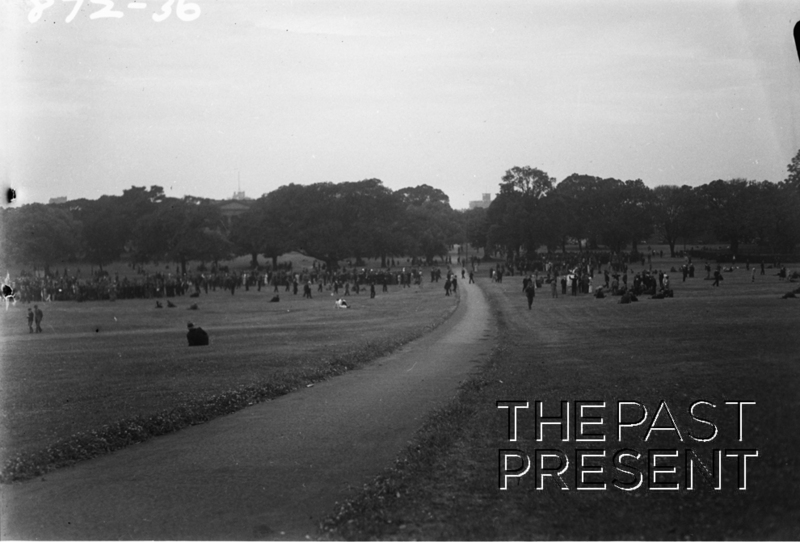 This entry was posted in New South Wales, Sydney and tagged 1930s, black and white, parks and gardens, photographic collection, tourism.